Rough-toothed dolphin (front) and bottlenose dolphin (back). The rough-toothed dolphin is very distinct with a long, smooth head and narrow beak. On average, these dolphins reach a length of 2.6 m (8.5 ft) and weight of 160 kg (350 lbs). Image credit, Daniel Webster, NOAA. Rough-toothed dolphins (Steno bredanensis) are found primarily in deep waters throughout tropical and subtropical areas of the world, including Hawaii, the Gulf of Mexico, and the Mediterranean Sea. They are easily distinguished by their long, smooth head and narrow beak, and the lack of a bulbous melon. Their body color is dark, with white lips and throat. The belly (ventral) surface has irregular spots and blotches. In addition, white and yellowish scars are usually present on the body, a result of fighting with other rough-toothed dolphins or bites from squid and/or cookie cutter sharks. Rough-toothed dolphins are named for vertical ridges that occur on their teeth, giving them a “roughened” appearance. Their diet consists of fish and cephalopods, although they are notorious for depredating baited fishing lines. Rough-toothed dolphins typically form close-knit groups of 10-20 individuals (groups up to 90 individuals have been observed). 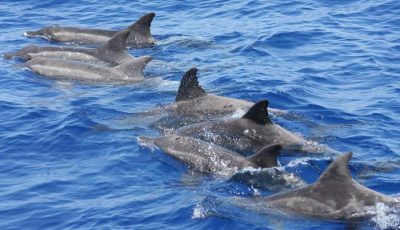 They also associate with other dolphin species such as short-finned pilot whales, common bottlenose dolphins, pantropical spotted dolphins, and spinner dolphins. Rough-toothed dolphins typically form groups of 10-20 individuals. They produce simple, short-duration whistles that commonly range from 2.5 to 10 kHz. Image credit: Cascadia Research (www.cascadiaresearch.org). Although little is known about the species, whistles and broadband click sounds have been recorded from these dolphins. Rough-toothed dolphins produce short-duration (~ 0.5 s) whistles that range in frequency, on average, from 2.5 to 10 kHz. These whistles are simple in their structure, containing an average of 1.5 steps. The limited available data on Pacific rough-toothed dolphins suggest they produce broadband echolocation clicks from 10 to 90 kHz that can occur in a series or short bursts of 0.1-0.2 seconds. Folkens, P. A., & Reeves, R. R. (2002). Guide to marine mammals of the world (1st ed). New York: A.A. Knopf : Distributed by Random House.